October 5, 2013 - The U.S. House passes H.R.3223, the Federal Employee Retroactive Pay Fairness Act which has been sent to the U.S. Senate for a vote. The Federal Employee Retroactive Pay Fairness Act will provide compensation for federal employees furloughed due to any lapse in appropriations that begins on October 1, 2013, for the period of such lapse in appropriations. This bill does not cover private contract employees. The National Air Traffic Controllers Association said in a press release the House action is a much needed first step in providing some relief to those who have been furloughed by this unacceptable government shutdown. These dedicated public servants, including 3,000 aviation safety professionals represented by NATCA, want to return to work. “Those still working but not being paid until the shutdown ends, including air traffic controllers, want their furloughed colleagues to return as well. No one should be under the illusion that it is business as usual for air traffic control under a shutdown. “Even though air traffic controllers and other aviation safety professionals have been maintaining the safety of the system, this furlough is rapidly eliminating critical layers of redundancy and safety that are needed to keep the system operating at full capacity. 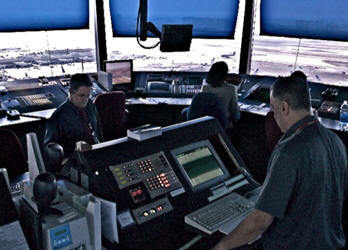 “Aviation safety professionals work every day in a system with no room for error. These furloughs are making an already complicated and stressful job even more so by removing key human components of the aviation system. “The National Air Traffic Controllers Association’s entire membership is vital in keeping the American airspace the safest, most efficient system in the world. NATCA joins the voices of millions of Americans who are calling for an end to the shutdown so that all FAA employees can continue the work of controlling traffic in the safest, most efficient aviation system in the world”.